The Ba Xuyen pig is a derivative of Craonnais, Chinese pigs and Berkshire pig. The clever pig domesticated in South East Asia is well adapted to salt-water environment of Mekong River delta of southern Vietnam. Features include human like enamel coated teeth, very short legs. They have short bodies, white feet and black and white spots. The coat hair is short to medium, tail twisted. It has a pinkish white body with black patches all over the body. Other characteristics include medium sized ears, slightly curved snouts and wrinkles on forehead. It has a big belly, hips wide. It takes ten months to attain full maturity and weigh 100kg. • coat hair is short to medium, tail twisted. 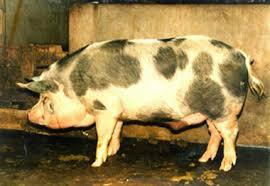 The Ba Xuyen pig sows are highly prolific at given birth. They produce an average of eight piglets thrice a year. The animal is believed to be fastidiously clean and disease resistant. The downside is that some diseases they carry are transmittable to humans. The pig is concentrated in the provinces of Kien Gianf, Vinh Long and Tien Giang. Other are Dong Thap, Can Tho and Long An areas. You find them in Soc Trang and Vi Xuyen district. Ba Xuyen pig are well adapted to scavenging and locating roots with their strong olfactory snout. The animal is omnivorous and capable of consuming a wide variety of food. Common diet includes grains, rice and fodders. The domesticated pig has good commercial value and used for meat. They are also kept as pets or waste disposal tools. A popular pet in south-east Asia, Vietnam they are also ideal for intense farming.